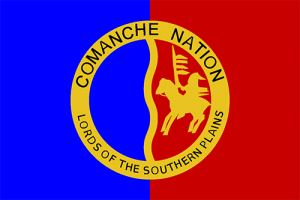 Comanche Nation is a federally recognized tribe with tribal enrollment numbers totaling 16,372 with roughly 7,763 members residing in Lawton-Ft. Sill and surrounding areas of Southwest Oklahoma. The Comanche Nation headquarters is located just north of Lawton, Oklahoma. Shortly before 1700 the Comanche emerged as a distinct group when they broke off from the Shoshone people living along the upper Platte River in Wyoming. They separated from the Shoshone after they acquired horses from the Pueblo Indians after the Pueblo Revolt, as the horses allowed them greater mobility in their search for better hunting grounds. Their original migration took them to the southern Great Plains, into a sweep of territory extending from the Arkansas River to central Texas. The Comanche never formed a single cohesive tribal unit, but were divided into almost a dozen autonomous groups, called bands. These groups shared the same language and culture, and rarely fought each other Comanche groups did not have a single acknowledged leader. Instead, a small number of generally recognized leaders acted as counsel and advisors to the group as a whole. These included the “peace chief”, the members of the council, and the “war chief”. The peace chief was usually an older individual, who could bring his experience to the task of advising. There was no formal inauguration or election to the position, it was one of general consensus. The council made decisions about where the band should hunt, whether they should war against their enemies, and whether to ally themselves with other bands. The Comanche men did most of the hunting and all of the fighting in the wars. They learned how to ride horses when they were young and were eager to prove themselves in battle. They were formidable opponents who developed strategies for using traditional weapons for fighting on horseback. Warfare was a major part of Comanche life. On the plains, Comanche women carried out the demanding tasks of cooking, skinning animals, setting up camp, rearing children, and transporting household goods. The Comanche children were considered their most precious gift and were rarely ever punished. Both girls and boys were welcomed into the band, but boys were favored. Entering the Western economy was a challenge for the Comanche in the late 19th and early 20th centuries. Many tribal members were defrauded of whatever remained of their land and possessions. Appointed paramount chief by the United States government, Chief Quanah Parker campaigned vigorously for better deals for his people, meeting with Washington politicians frequently; and helped manage land for the tribe. Parker also campaigned for the Comanches’ permission to practice the Native American Church religious rites, such as the usage of peyote, which was condemned by European Americans. Today the Comanche Nation government along with the Comanche tribal leaders continue to serve and protect its tribal members. Comanche Nation offers a variety of programs and services designed to empower those in need and include: Career Services, Family Services, Health Services, Public Safety Services, Culture Preservation, and Community and Employment Services. These services seek to improve the economic, moral, educational, and health status of its tribal members and to promote the common well-being of the tribe and its membership. Their original migration took them to the southern Great Plains, into a sweep of territory extending from the Arkansas River to central Texas. They reached present-day New Mexico and the Texas Panhandle by 1700, forcing the Lipan Apache people ever southward, defeating them in a nine-day battle along the Rio del Fierro (Wichita River) in 1723. The River of Iron may be the location mentioned by Athanase de Mézières in 1772, containing “a mass of metal which the Indians say is hard, thick, heavy, and composed of iron”, which they “venerate…as an extraordinary manifestation of nature”, the Comanche’s calling it Ta-pic-ta-carre [standing rock], Po-i-wisht-carre [standing metal], or Po-a-cat-le-pi-le-carre [medicine rock], the general area containing a “large number of meteoric masses“. By 1777, the Lipan Apache had retreated to the Rio Grande and the Mescalero Apache to Coahuila. The Comanche Nation headquarters is located just north of Lawton, Oklahoma. The tribe operates its own housing authority and issues tribal vehicle tags. They have their own Department of Higher Education, primarily awarding scholarships and financial aid for members’ college educations. Additionally, they operate the Comanche Nation College in Lawton, Oklahoma. They own ten tribal smoke shops and four casinos. The casinos are Comanche Nation Casino in Lawton; Comanche Red River Casino in Devol; Comanche Spur Casino, in Elgin; and Comanche Star Casino in Walters, Oklahoma. Comanche tribal enrollment now numbers 16,372 with approximately 7,763 members residing in the Lawton-Ft.Sill and surrounding areas of Southwest Oklahoma. The Comanche Nation complex is located nine miles north of Lawton, Oklahoma and employs about four-hundred people.